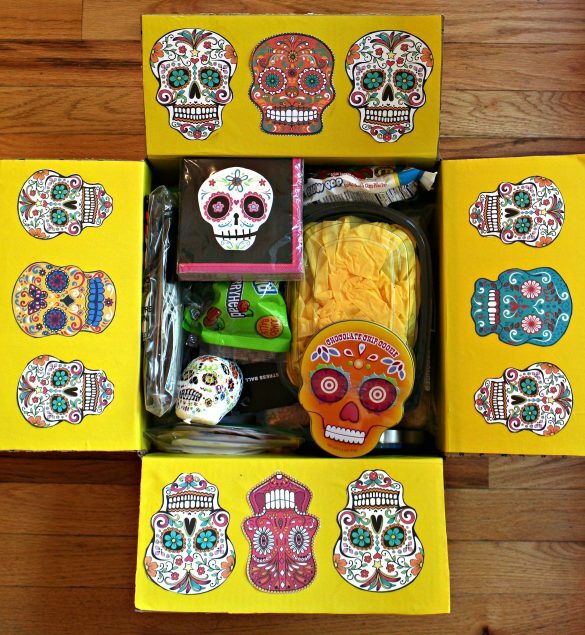 Dia de los Muertos (Day of the Dead), celebrated on November 2, is a holiday with many traditions. Some of those traditions are both colorful and sweet! The swirls of colorful dots on Dia de los Muertos Sugar Cookies are inspired by the festive, cut-paper banners that decorate the holiday alters in Mexico. Last week I shipped a “celebration in a box” to Soldier L. in Kuwait. For something a little different than the Halloween themed boxes I usually send in October, this box was over-filled (quite literally) with a Dia de los Muertos celebration. When I first thought of the idea a few months ago, I wasn’t sure if I would find enough things to fill the box. So for several months, every time I saw something that fit the theme, I bought it and stored it away. Then I baked. I baked Pabassinas and I baked Dia de los Muertos Sugar Cookies. The recipes made a LOT of cookies. No worries. The soldiers share with each other, so there is no such thing as too many. Unless you are trying to fit everything in one “large” (but only “large” relative to the other available sizes) USPS box. No matter how I played Tetris with the contents, I couldn’t fit it all in. So I mailed two boxes instead. Part 1: Care Package Contents: I lined the boxes with bright yellow wrapping paper. I found a variety of colored images of Dia de los Muertos skulls online. I printed them out on regular paper and on card stock, then cut them out. The skulls on regular paper were glued onto the box flaps and on the inside bottom of the boxes. Keep in mind that the contents of the first box ended up overflowing into a second box. In addition to 5-6 dozen Pabassinas and Dia de los Muertos Sugar Cookies, I packed Bat Gliders and Skeleton Paratroopers (Thank you, Gina for the idea! 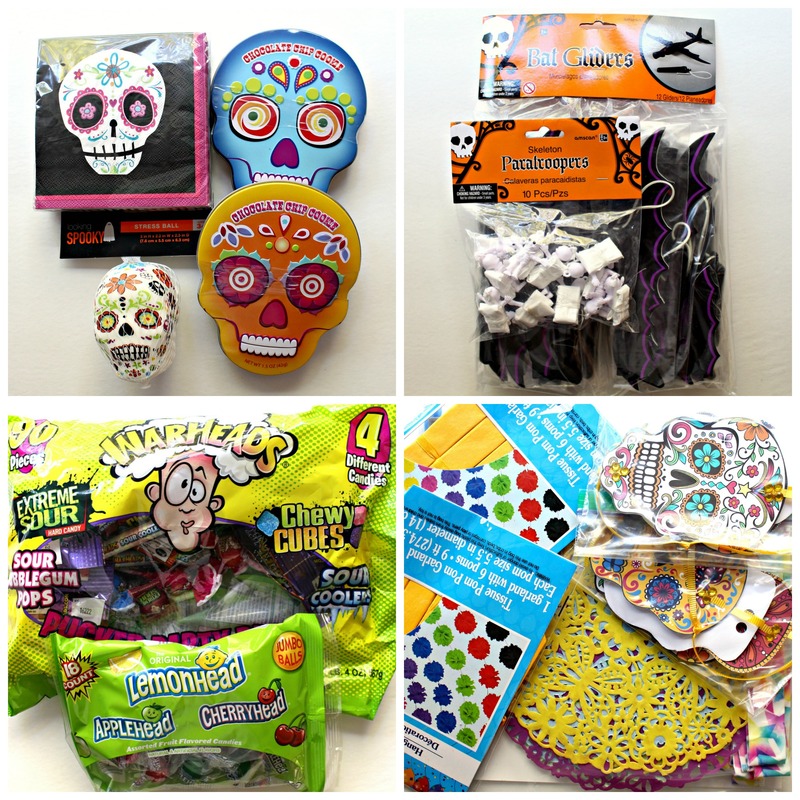 ), skull tins with a packaged cookie inside, magazines, Dia de los Muertos coloring pages and colored pencils, napkins, candy, a candle, and a skull shaped stress ball. I also included some homemade decorations. 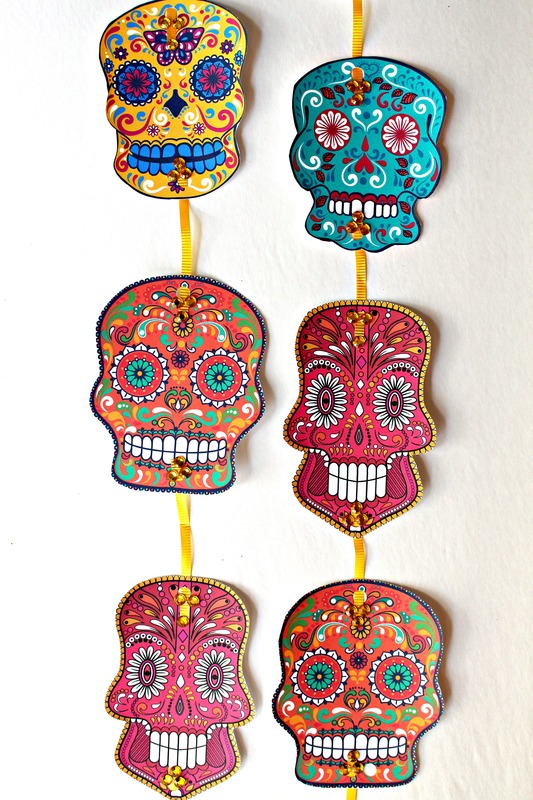 Traditionally, Dia de los Muertos decorations include papel picado, banners made of cut tissue paper. 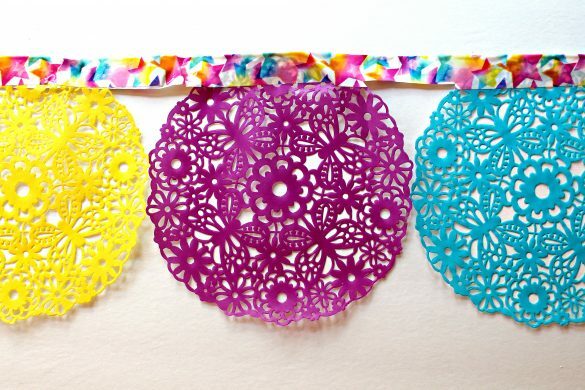 I made a quick version of papel picado using doilies from Michael’s and decorative duct tape. I strung the skulls I had printed on cardstock with ribbon to create hanging decorations. 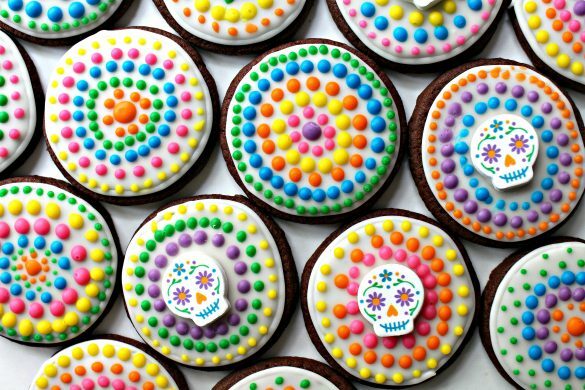 Part 2 Circle Sugar Cookies: The vibrant colors of Dia de los Muertos decorations swirl around these festive cookies. All of the designs I use on iced sugar cookies for Monday Box military care packages have to be both easy (so that I am actually capable of making them) and eye catching. The dotted patterns on these cookies definitely caught my eye when I first saw the design on Pinterest, but the pin didn’t lead to the creator. 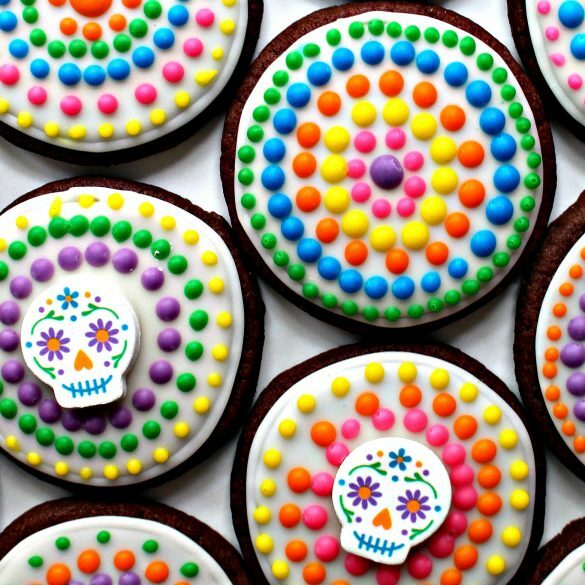 I can’t give credit to the original artist, but I appreciate the inspiration and the simplicity of this Dia de los Muertos Sugar Cookies design! I tried decorating a few skull cookies, but I was not happy with the results. The skulls were ugly. Dia de los Muertos skulls have pretty designs and flowers. Mine looked more appropriate for a spooky Halloween. 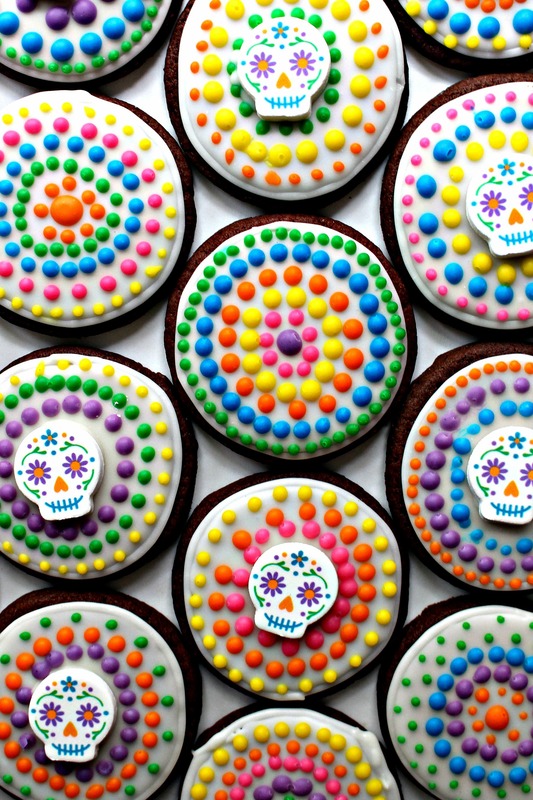 Luckily, I found Wilton candy skulls and added them to some of the dotted cookies for Dia de los Muertos flair. 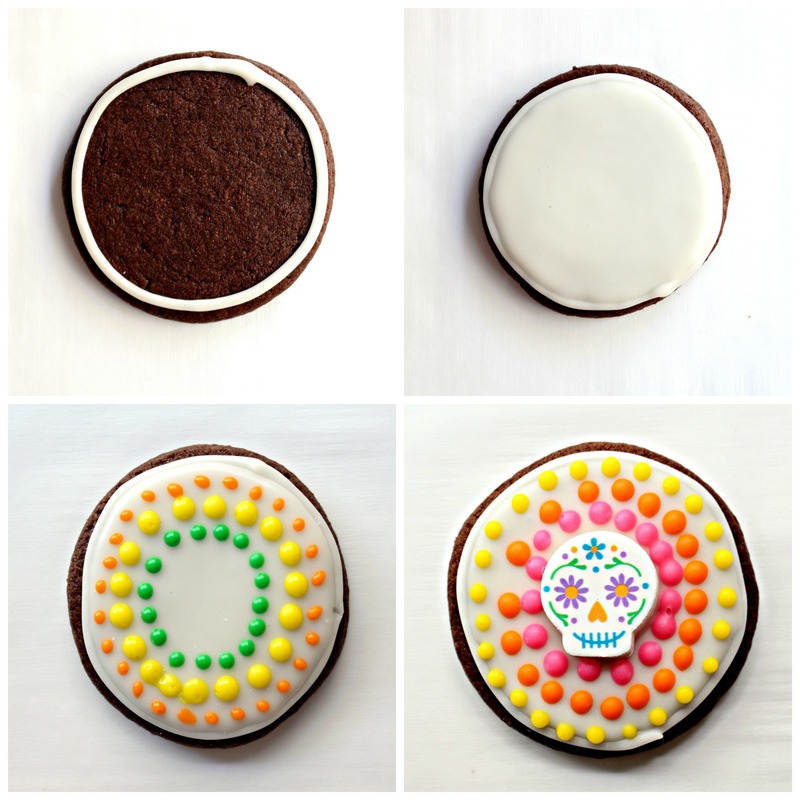 One batch of chocolate sugar cookies makes about 32- 2” circles cookies. Two batches of corn syrup icing are needed. The first batch of icing is used white, to cover the surface of the cookies. It should be the consistency of white glue. The icing is spooned into a piping bag or plastic bag. A tip with a small opening (I used Wilton #3) or a tiny corner cut from the bag is used to pipe the icing, outlining the cookie, then filling in the outline. Allow the surface to set until dry to the touch (at least 2 hours). The second batch of icing, a little thicker than the white icing, is divided into 6 bowls and colored with a few drops of food coloring gels. The colored icing is spooned into separate piping bags or plastic bags. Use a very small piping tip (I used Wilton #1), or very small corner cut from the tip of the bag, to pipe circles of dots on the white surface. If using pre-made decorations at the center of the cookie, only pipe two circles of dots, leaving the center empty. Allow the dots to set for a few hours before attaching the decorations with a dab of icing as glue. Always air dry iced sugar cookies overnight to allow the icing to harden before packing. I place each cookie individually in a self-sealing plastic bag. The bagged cookies are then placed snugly either in an airtight plastic storage container or stacked snugly in a freezer weight ziplock bag. Part 3 New Recipe: Pabassinas are the new recipe included in this care package. 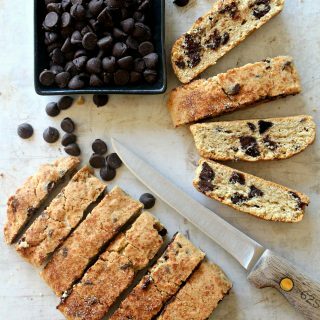 Pabassinas are a raisin-nut cookie flavored with anise and orange. 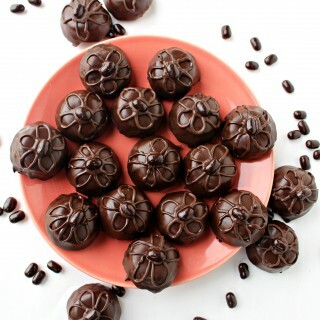 A coating of orange flavored icing seals in freshness for at least 10 days. A sprinkling of sparkling sugar and Pabassinas are ready to celebrate! 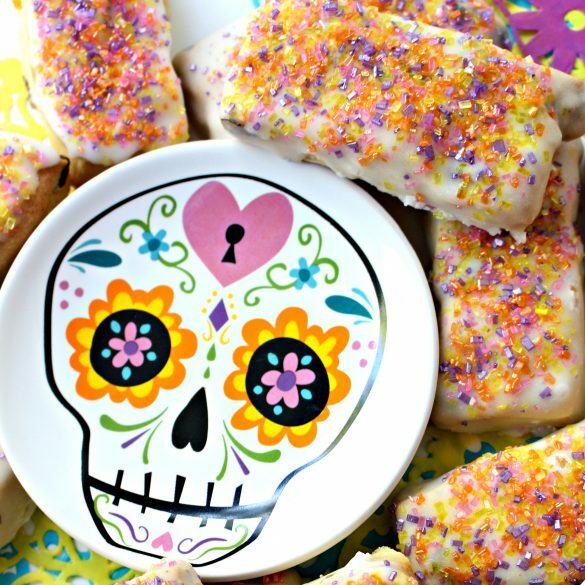 Whether the cookies come from a jar in your kitchen or from a care package far away, Dia de los Muertos Sugar Cookies and Pabassinas add sweetness to the day! These are so fun and absolutely beautiful. The colors and care with which you decorated these lovely cookies is amazing. I had to come and grab a PIN! Have a lovely weekend. Thanks, Gina! I certainly hope you are correct and Soldier L knows he is important to me. That’s the whole point, right? Thank you so much for the gliders and paratroopers idea! I too hope that they bring as much joy as your package brought to your troops! The video you received was fabulous! Warm and fuzzy feedback! These are very funny , adorable, colorful Halloween. You really done creative recipe. 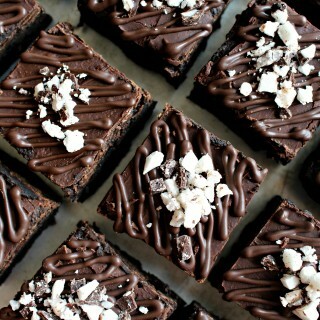 Thank you for these cute recipe. I LOVE the way these cookies came out Wendy! They are so pretty yet also perfectly spooky! And all those colors … I love that! I find those concentric circles mesmerizing! So pretty. At first I thought they were little candies, they looked so perfect. Love the skull stress ball. So funny. Thanks, Cindy! No special talent here. The dots easily stay more or less the same size as you get used to using the same pressure for each one. Though it was repetitive, the circles are very calming to create. Beautiful post! Love the sugar cookies, pinning for later! I am thinking to make some cookies with royal icing this Christmas. I haven’t done any royal icing fore. I will have to learn from you. Do you think corn syrup icing is easier to make than royal icing? Thanks! Thanks, Lokness! I always include several dozen cookies in my care packages because soldiers always share. No jealousy and more smiles! 🙂 Good luck with the royal icing. There is a learning curve to creating and working with royal icing, but its quite doable. Corn syrup icing is a lot easier and tastes better, but can’t be used for all of the different techniques that are used with royal icing. Thank you, Edye. They were fun to make! 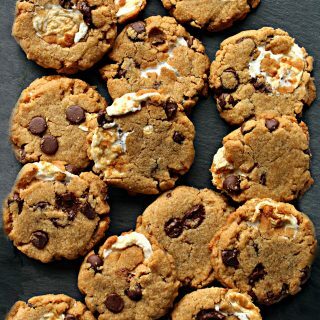 What beautiful – and delicious – cookies! Thank you so much for sharing them with us at Hearth and Soul. These cookies are just beautiful, and a true work of art. Some Soilder is very special to get this box! Hope you have a great week and thanks so much for sharing with Full Plate Thursday. What a beautiful looking bunch of cookies! I love all the bright colors, they really pop! Thank you, Petra! I love the colors too! 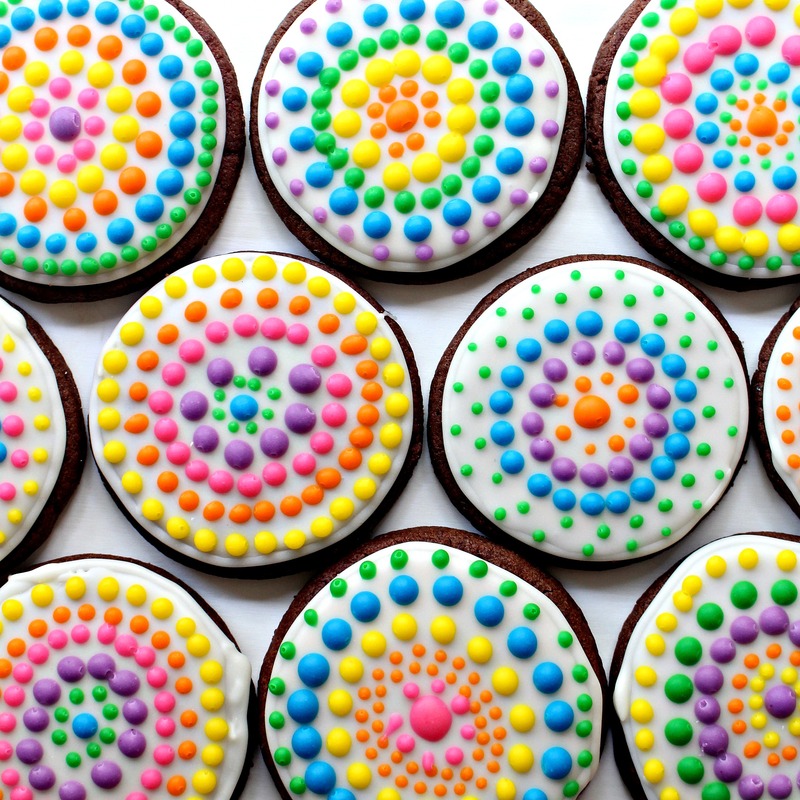 Your cookies are so colourful and neatly piped. You’ve put so much effort into this care package as always! Thank you, Kat! It turns out that dots are easy! 🙂 A wee bit monotonous, but easy! These are so vibrant & fun! Thanks for sharing with Merry Monday. These are super cute. My sister loves sugar skulls and I may need to make some of these for a care package for her. Bless you and bless the soldier recipient of this darling box. I love, love, love dia de los muertos. Always create an altar for my nephew. And in my work as an elementary librarian in a predominantly Hispanic community, I enjoy sharing this celebration of life with my students. I have written about the holiday on my blog as well. 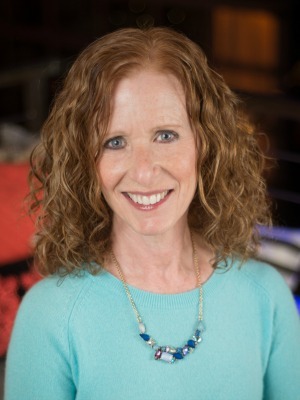 Came across your link on Penny’s Passion Friday Favorites. So glad I did! Thank you for your thoughtfulness and big heart! 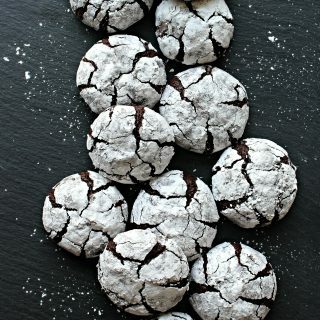 These cookies are just beautiful, I pinned them! I really appreciate you sharing your awesome post and your talent with us at Full Plate Thursday. I found you through one of the link up parties I frequent. However, I’ve been browsing your site for so long, I forgot which one! Anyway, I’m so glad I found you. I love these cookies! More importantly, I love everything about your blog. I’m a mom of one away at college and one heading into the Navy this week. I will definitely be back for some inspiration. Thank you SO much for sharing! Hi, Jenny! I am so glad you found The Monday Box, however you got here! 🙂 The desire to stay connected with our kids is universal. We do our jobs right, and they fly, but that doesn’t mean it’s easy. My heartfelt gratitude to your son and to your entire family for your service! Oh so fun! My middle son is a bit obsessed with the Dia De Los Muertos celebration so I just had to check out your goodies. I bet they brought a huge smile to our service men and women! 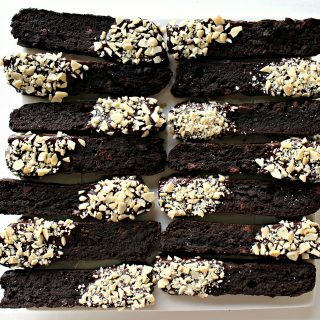 These cookies are absolutely beautiful! They make me smile every time I see them on all the different link parties! Thank you for the inspiration! Beautiful cookies! Thanks for sharing at the What’s for Dinner party – can’t wait to see what you’ll bring next week. Have a fabulous week ahead. Thank you, Helen! They were fun to make and cheerful to share!